Frisco City Council has approved another great project for Nack Development. Frisco residents can look forward to a unique, mixed-use development at Elm and 1st Street in The Rail District. 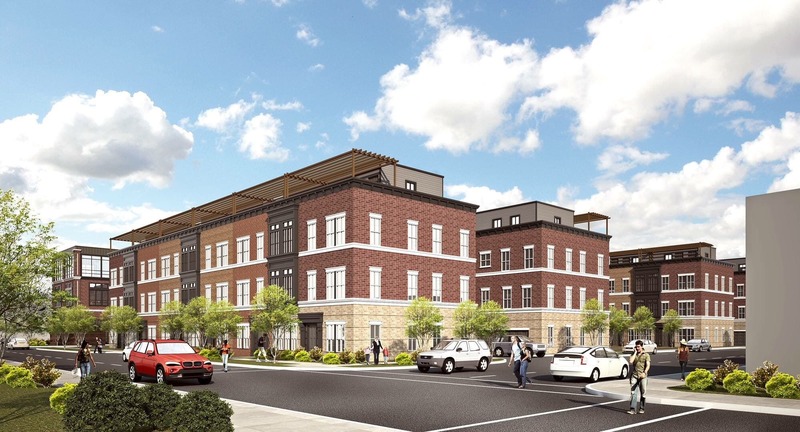 This latest venture will be comprised of 20 upscale residential Brownstone homes and 24,000 square feet of office space to be named The Calaboose at The Rail. Set amidst open park and green space, the project aims to act as a strong connection between Frisco Square and old downtown Frisco promoting a walkability factor in this revitalized area of downtown now known as The Rail District. The site once housed a small concrete jail built around 1912 for the then-tiny railroad town of Frisco. Prisoners would be kept in this small, one-room compound until released or sent to the county jail. The word calaboose comes from the Spanish word calabozo, meaning, dungeon. The building was used until the 1950’s and despite efforts to save it, the crumbling structure had to be demolished in 2013. A replica was eventually built behind the Frisco Heritage Center with some parts of the original structure preserved and included. Watch a video of the demo day ceremony here. The new Calaboose development will incorporate a mix of three-story office space/commercial buildings alongside townhomes, offering a unique type of housing that is not currently offered in Frisco but is generally common in downtown areas. These Brownstone-style townhomes will have rooftop decks and will frame a central open space feature. Think open plazas, wide sidewalks, enhanced paving, landscaping, benches, and water features, with all of the desired amenities expected in a downtown, urban, pedestrian environment. Although the original building is already gone, I wanted to try to pay tribute to the historic jail and location. The 4th floor of the Brownstones is considered a tip of the cap to the original Calaboose and the vertical columns in the architecture of the commercial building will mimic the parallel lines of a railroad track. Churchman is very mindful of the impact the changes could have on the existing residents in the area and met with adjacent landowners to the site in June. Property owners attended, received an overview of the project, posed questions, and a healthy discussion took place where general support was expressed to continue. This will be the third project approved and ready to break ground in The Rail District for Nack Development, contributing a huge amount to the revitalization of the area. Others include The Tower at The Rail and The Patios at the Rail. Since I decided to focus on the renaissance of downtown, I’ve known we must make downtown sustainable for the merchants. The number one way to do that is to bring pedestrian traffic to downtown. The Calaboose does this with its residential component and the addition of the office space. The project is targeted to break ground Spring of 2019. Churchman consistently speaks with passion about creating a space where people like to stay all day, and spend time taking in the many aspects of an area with their family and friends. At the August 7, 2018 Frisco City Council meeting, Mayor Jeff Cheney re-affirmed his delight and support for the project and further progress in the revitalization of the downtown area. He believes The Rail District is “the heart of the community” and has stood by his commitment to Rejuvenate Downtown Frisco – the third item on his list of nine priority areas – or “planks” – as part of the 100 days of Progress in Motion for Frisco.